The mandate of the Patented Medicine Prices Review Board is to ensure that prices at which patentees sell their patented medicines in Canada are not excessive; and to report on pharmaceutical trends of all medicines and on R&D spending by patentees. The PMPRB Annual Report includes a review of the PMPRB´s major activities, analyses of the prices of patented medicines and of the price trends of all drugs, and reports on R&D expenditures as reported by patentees. This year, the PMPRB Annual Report 2011: In Brief, a summarized form of the Annual Report, was published and distributed to subscribers in both electronic and hard copy. Its purpose is to provide stakeholders/subscribers with all of the pertinent information contained within the Annual Report in a condensed form while reducing distribution costs and our carbon footprint. The full Annual Report 2011 can be accessed electronically in pdf and HTML formats on the PMPRB website. The Honourable Leona Aglukkaq, P.C., M.P. I have the pleasure to present to you, in accordance with sections 89 and 100 of the Patent Act, the Annual Report of the Patented Medicine Prices Review Board for the year ended December 31, 2011. The Patented Medicine Prices Review Board (PMPRB) is an independent quasi-judicial body established by Parliament in 1987 under the Patent Act (Act). The PMPRB has no authority to regulate the prices of non-patented drugs and does not have jurisdiction over prices charged by wholesalers or pharmacies, or over pharmacists´ professional fees. As a reliable, impartial source of comprehensive information on drug prices, the PMPRB is committed to transparency, accessibility and stakeholder engagement. 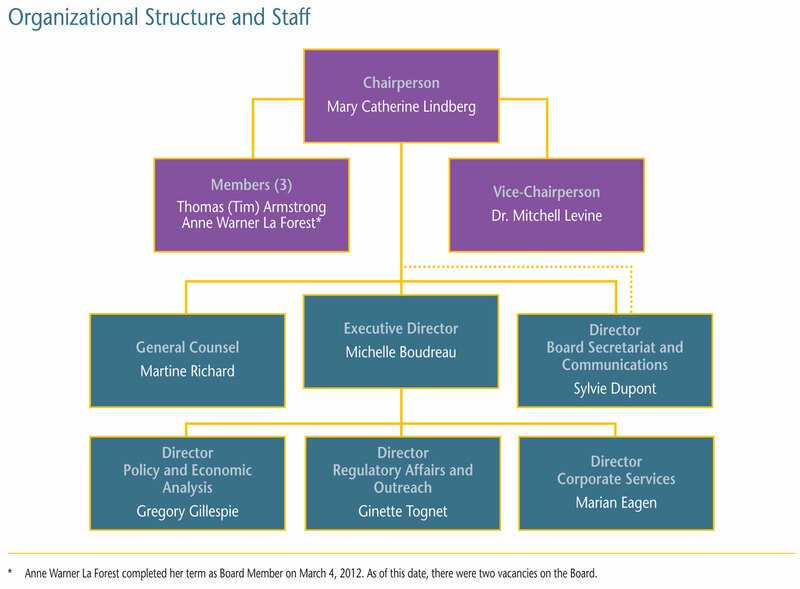 The Board consists of up to five members who serve on a part-time basis. Members, including a Chairperson and a Vice-Chairperson, are appointed by the Governor-in-Council. The Chairperson is designated under the Act as the Chief Executive Officer of the PMPRB with the authority and responsibility to supervise and direct its work. Dr. Mitchell Levine was appointed Member and Vice-Chairperson of the Board on March 3, 2011. Prior to his appointment to the Board, Dr. Levine had been a member of the PMPRB´s Human Drug Advisory Panel. Member: Thomas (Tim) Armstrong, QC, O. Ont. Tim Armstrong was first appointed Member of the Board in October 2002 and was re-appointed for a second term in 2007. Anne Warner La Forest was a Member of the Board from March 2007 until the completion of her term on March 4, 2012. The PMPRB operated with a budget of $11.8 million in 2011/12 and an approved staff level of 76 full-time equivalent employees. Of the total budget, $3.1 million resided in a Special Purpose Allotment (SPA) reserved for hearings. Unspent SPA funds were returned to the Consolidated Revenue Fund. The PMPRB regularly informs its stakeholders of its activities through publications such as the Annual Report and the quarterly NEWSletter. It also publishes the results of NPDUIS analytical research reports. In 2011, the PMPRB moved to electronic-only publications to reduce costs and decrease the environmental impact of printing. Both industry and non-industry stakeholders are regularly consulted and updated by the PMPRB. Industry stakeholders are promptly informed of changes in the operating environment and/or the regulatory process. To facilitate patentees´ access to information, the Regulatory Affairs and Outreach Branch conducts outreach sessions with patentees. In 2011, the PMPRB introduced a plan to enhance non-industry stakeholder engagement. Through a series of bilateral exchanges with federal/provincial/territorial health representatives, consumer representatives, patient-advocacy groups and others, the PMPRB strives to foster greater awareness of its role and contribution. To enhance its communication and outreach, the PMPRB revamped its website, expanded its reach through the use of social media such as Twitter, and introduced webinars as an alternate means of briefing patentees. The PMPRB is responsible for regulating the prices that patentees charge for patented drug products sold in Canada to ensure that they are not excessive. Patentees are required by law to file information pertaining to the sale of their drug products in Canada. The Patent Act (Act) along with the Patented Medicines Regulations (Regulations) set out the filing requirements, and Board Staff reviews the pricing information on an ongoing basis. The price of a patented drug product is under the PMPRB´s jurisdiction until the drug´s patent(s) expire. Although patentees are not required to obtain approval of the price prior to selling the patented drug product, they are required to ensure that the price is not excessive. Board Staff reviews the prices of each strength of an individual dosage form of each patented medicine sold in Canada. There are several factors used for determining whether a drug product is excessively priced, as outlined in section 85 of the Act. The Compendium of Policies, Guidelines and Procedures (Guidelines) details the various price tests used by Board Staff to determine whether a price charged by a patentee falls within the maximum allowable price. The total number of patented drug products for human use in 2011 was 1282. The table below provides a breakdown in terms of new and existing patented drug products as well as a summary of the status of the price review. On January 1, 2010, the Board´s new Guidelines came into force, providing direction to patentees and Board Staff on the application of factors set out in the Act and the Guidelines to determine if the price of a patented drug product sold in Canada is excessive. The PMPRB monitors and evaluates the application of the new Guidelines on an ongoing basis to ensure that they remain relevant and effective. In 2011 and up to May 31, 2012, the Chairperson approved 15 VCUs to reduce the price of patented drug products to a non-excessive level. In addition to price reductions, excess revenues totaling $24 million were offset by way of payments to the Government of Canada through VCUs and Board Orders in 2011 up to May 31, 2012. No new Notices of Hearing were issued in 2011. Decisions are pending in the matters of Sandoz Canada Inc., on failure to file, and Pentacel and Quadracel, on remedy. Two proceedings are ongoing: Apotex Inc., on failure to file, and Apo-Salvent CFC Free, on price. Since 1993, the Chairperson has approved a total of 87 VCUs and initiated 25 public hearings. Approximately $123 million have been collected through VCUs and Board Orders by way of payments to the Government of Canada. Three Board decisions are currently subject to judicial review by the Federal Court for the following: ratio-Salbutamol HFA; ratiopharm Inc. (now Teva Canada); Copaxone Redetermination. Hearing dates have yet to be set in all three cases. In January 2011, the Supreme Court dismissed the appeal by the Celgene Corporation, confirming the Board´s jurisdiction over the price of Thalomid. The decision recognized that the purpose of the Board´s legislative mandate is the protection of consumers. In 2011, sales of patented drug products increased to $13.1 billion from $12.9 billion in 2010, an increase of 1.7%. By comparison, the annual growth in sales stood at 27.0% in 1999 and remained in double-digits until 2003. Throughout the latter part of the 1990s, sales growth was largely driven by a succession of new “blockbuster” products that achieved very high sales volumes. Since that time the pharmaceutical industry has not introduced new high-volume products in sufficient numbers to sustain double-digit sales growth. Older drug products, introduced between 1995 and 1999, still accounted for nearly one quarter of 2011 sales. The share of patented drug products in overall drug sales has also declined since 2003, implying that sales of generic and non-patented branded drug products have grown faster than sales of patented drug products. In 2011, the share of sales of patented drug products was 59.1%, an increase of 1.7% from the previous year. The increase in sales was largely driven by the introduction of new drugs and the increased use of existing drugs. Changes in price did not contribute to the increase in sales for 2011. Drugs in the cardiovascular system therapeutic class accounted for the greatest decrease in sales, while those in the antineoplastic and immunomodulating agents class accounted for the greatest increase. The PMPRB uses the Patented Medicines Price Index (PMPI) to monitor trends in prices of patented drug products sold in Canada. The PMPI measures the average year-over-year change in the ex-factory prices using a formula that takes a sales-weighted average of price changes observed at the level of individual products, similar to the approach used to calculate the Consumer Price Index (CPI). The PMPI has been consistently below the CPI. 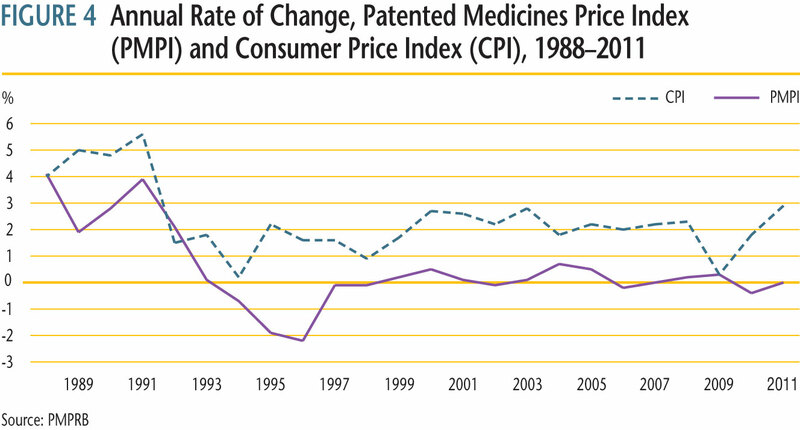 As measured by the PMPI, prices of patented drug products have, on average, remained unchanged (0.0%) between 2010 and 2011. The average rates of price change by class of customer were obtained by applying the PMPI methodology separately to sales data for hospital, pharmacy and wholesale customers. The 2011 rates of price change for these classes were, respectively, -2.2%, 0.6% and 0.9%. The Act and Regulations require patentees to report publicly available ex-factory prices of their patented drug products for seven foreign comparator countries: France, Germany, Italy, Sweden, Switzerland, the United Kingdom, and the United States. The PMPRB uses this information to conduct its international price comparison tests. In 2011, the United States saw prices rise on average at a rate of 10.9%. Germany and the United Kingdom saw much more modest average price increases (2.1% and 0.2%, respectively), while prices in France, Italy, Switzerland and Sweden declined (-2.9%, -1.1%, -4.1% and -0.7%, respectively). On an annual basis, the PMPRB conducts bilateral and multilateral price comparisons for each of the seven comparator countries using market exchange rates for currency conversion. As in previous years, in 2011, Canadian prices were typically within the range of prices observed among the comparator countries. Results indicate that Canadian prices were roughly in line with Swedish and Swiss prices (5% lower and 3% higher, respectively). Prices in Italy, France and the United Kingdom were appreciably lower than Canadian prices (16%, 16% and 18%, respectively), while those in Germany and the United States were much higher than prices in Canada (20% and 98% higher, respectively). The median international price (MIP), the median of prices observed among the seven comparator countries, is one of the measures used in multilateral price comparisons. 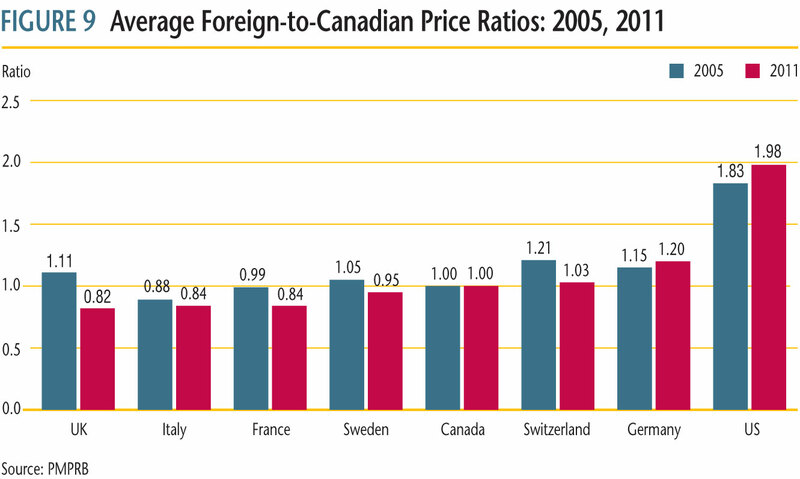 The average MIP-to-Canadian price ratio stood at 1.05 in 2011. This indicates that the median price of patented dug products in the seven comparator countries was 5% higher than Canadian prices last year. Since 2006, the ratio has remained somewhat consistent, ranging between 1.07 and 1.03. 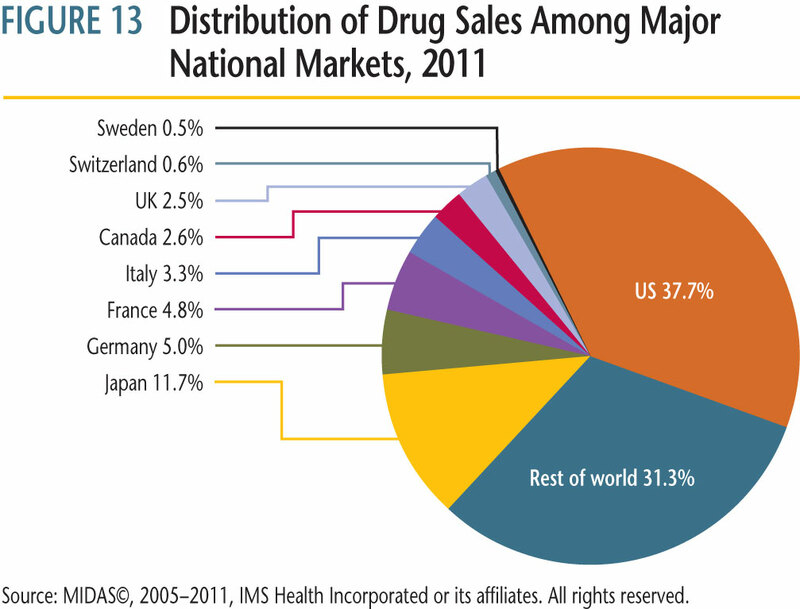 Based on global sales data provided by MIDAS©, 2005−2011, IMS Health Incorporated or its affiliates (all rights reserved)1, the Canadian market accounted for 2.6% of the global market in 2011. The Canadian share has remained between 2.4% and 2.7% from 2005 to 2011. During that same time period drug sales in Canada rose at an annual average rate of approximately 5.2%. Drug sales among the seven comparator countries rose at an annual average rate of 4.2% over the same period. The proportion of national income allocated to the purchase of drug products provides another way to compare drug costs across countries. Based on data for 2009, drug expenditures accounted for between 1.1% and 2.1% of the GDP in the seven comparators. The Canadian value of 1.9% lies near the upper end of this range. Patentees reported total 2011 sales revenues of $17.8 billion, an increase of 4.7% from 2010. Sales revenues reported by Rx&D members were $13.5 billion, accounting for 75.5% of the total. Patentees reported R&D expenditures of $991.7 million in 2011, a decrease of 15.8% over 2010. Rx&D members reported R&D expenditures of $901.2 million in 2011, a decrease of 9.9% over last year. Rx&D members accounted for 90.9% of all reported R&D expenditures in 2011. When the Act was amended in 1987, Rx&D members made a public commitment to increase their annual research and development expenditures to 10% of sales revenues by 1996. This level of R&D expenditure was obtained by 1993, in some years exceeding 10%. 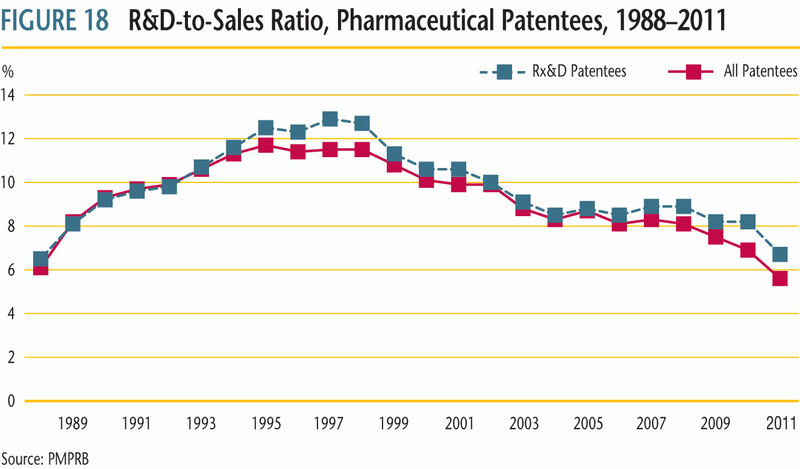 Since 2003, R&D-to-sales ratios for all patentees and for Rx&D members have declined. In 2011, the ratio of R&D expenditures to sales revenues for all patentees was 5.6%, down from 6.9% in 2010. These values are close to figures last observed in 1988. The ratio for members of Rx&D was 6.7%, down from 8.2% in 2010. These values are close to figures last observed in 1988. The Rx&D ratio has been less than 10% for the past nine consecutive years. Patentees reported spending $164.9 million on basic research in 2011, representing 17.3% of current R&D expenditures and a decline of 30.1% over the previous year. Patentees reported spending $525.1 million on applied research, representing 55.0% of current R&D expenditures. Clinical trials accounted for 75.2% of applied research expenditures. Compared to the PMPRB´s seven comparator countries, in 2009 Canada´s R&D-to-sales ratio was second lowest at 7.5%, ahead of only Italy. Ratios in all other comparator countries were well above Canada´s. On average, the R&D-to-sales ratio for all comparator countries was 20.1%. The R&D-to-sales ratios may be compared to the average foreign-to-Canadian price ratios reported earlier. 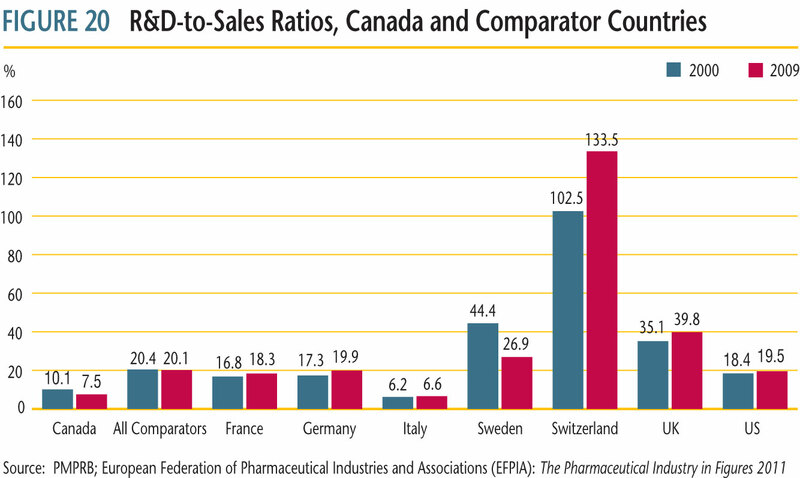 Several comparator countries, which have patented drug prices that are, on average, substantially less than prices in Canada, have achieved R&D-to-sales ratios well above those in Canada. Through the National Prescription Drug Utilization Information System (NPDUIS), the PMPRB and the Canadian Institute for Health Information work with their federal, provincial, and territorial government partners to provide critical analyses of price, utilization and cost trends. In 2010, the PMPRB worked closely with its partners to support drug plan policy decision making. The PMPRB published five NPDUIS reports in 2011. 1 Although based in part on data obtained under license from the MIDAS IMS database, the statements, findings, conclusions, views and opinions expressed in this Annual Report are exclusively those of the PMPRB and are not attributable to IMS AG.